We are probably some time away from being able to assess fully any battle of the Vietnam War. Indeed, we are still learning more about major engagements of World War Two some sixty years after the fact. The urgency around learning (or relearning) the lessons of Vietnam, though, is enough to reopen the books on many engagements that have gone ignored, forgotten, or unreviewed for some time. Near the top of that list must be the Battle for and the Siege of the U.S. Marine Corps firebase at Khe Sanh. Khe Sanh, Herr offers a memoir rather than history. And while he told with wit and empathy the stories of the men on the ground, the effort in the air to stave off a massive force of North Vietnamese regulars begs for review. Here, in the words of the U.S. Air Force, is that story. 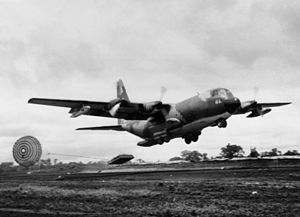 While certainly told from the service’s point of view, no other source gives quite the same appreciation of the scope and magnitude of the critical role that air support, resupply by air, aeromedical evacuation, and airmobility played in keeping Khe Sanh from turning into a replay of the French debacle at Dien Bien Phu thirteen years before. If nothing else, this account is a critical starting point for any examination of air power and the ground war in Vietnam. Also available from Amazon here.